Connecting the Selkirk community through information, resources, and engagement opportunities. 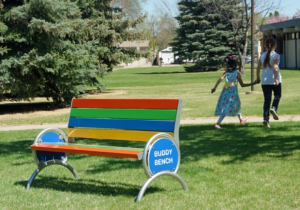 The project is called the “buddy bench.” It’s an ordinary bench placed in the schoolyard. The idea is that kids who are looking for playmates can sit on the bench to signal they would like someone to come ask them to play. We will be placing 3 benches and two signs on the school grounds. They will signs to inform kids what it is and how to use it. We will also be purchasing one plain wood bench which the kids can help design and paint. Video created by a 3rd grade class presenting their new Buddy Bench to their school. Parent Scott Young and his son Wyatt have started the Kindness Bookmark Project. Children are presented with bookmark templates and then colour and write suggestions on how to be kind and hide them in library books for others to discover. Give to family & friends. all-day Last Day of School! Copyright © 2019 Lord Selkirk PAC. Powered by WordPress. Theme: Spacious by ThemeGrill.